I am honored to be surrounded by the most amazing people. “I miss working with those kids so much,” I lamented to Tempest. “Then why don’t you teach an online short story workshop for teens?” she asked. The craziest part? I now have enough scholarships to stretch across three or four workshops. The prospect of continuing this venture brings me so much joy! But more importantly: I need students. If you are or know of a young writer aged 13-19, please share this post with them! The first class technically starts on April 1st, but that’s just when the short stories are due. We’ll start talking in an online group the following Sunday, and each Sunday after that. Since it’s an intimate class this first time around (so far), we’ll pick a time on Sundays that works for everyone. It has been suggested that I hold the next Teen Short Story workshop in June, when school is over for most teens…so keep your eyes peeled for announcements! 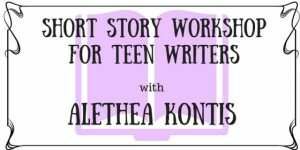 This writing workshop for young adults aged 13 to 19 will give students the opportunity for in-depth critiques on short fiction from YA, middle grade, and picture book author Alethea Kontis. Participants will learn how to critique and how to incorporate feedback from critiques for revision in a respectful and serious environment that prioritizes craft, community, and commitment to writing. The workshop begins April 1 and goes through April 29, 2018. In addition to giving and receiving critique, writers will take part in discussions about publishing, character development, structure, narrative voice, and other elements of short fiction. Students may workshop original fiction or fanfiction from any genre: fantasy, science fiction, horror, romance, mystery, or literary. Critique Sessions and Live Q&A will take place on Sunday April 8, 15, 22, and 29. There is no live session on April 1 (Easter). If you cannot make all of the live sessions you can still participate in this class. Writers must be present for their own critique and scheduling for the live sessions will take your availability into account. All peer critiques are due on Sundays. This class is for any person aged 13 to 19 who has an interest in writing fiction and has at least one complete story to workshop. Stories should be 500 to 8,000 words. It doesn’t have to be polished (that’s what we’re here to help you do!) but it must have a beginning, middle, and end. All stories must be ready to turn in by March 31st. All members of this workshop will have the opportunity to attend the “Steal Like A Pro – Writing Fiction Inspired By Other People’s Worlds (And How To Make It Your Own)” seminar with Alethea on April 14 for free (optional). There is finaicial aid available for stuents who cannot afford the class. We will award up to six scholarships for this class. Live Critique and Q&A sessions will take place over Zoom Video Conference software, which is free to download. To participate, students must have a microphone. A webcam is helpful, but not necessary. Students must have or have access to a Google account/Gmail. Stories will be uploaded to a private Google Drive folder for critique. Discussion will take place on a private Google Groups mailing list. CLICK HERE TO ENROLL, OR JUST FIND OUT MORE!